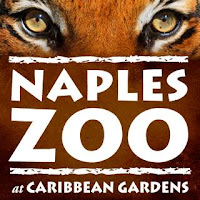 The Naples Zoo at Caribbean Gardens in southwest Florida is a natural wonder that will delight and inspire you to join in the conservation of our planet's wildlife and their wondrous inhabitants. As you enjoy the Zoo and historic garden, they strive to encourage understanding that all of us have the power to effect the future for people and animals by what we purchase, how we live, and whom we support. Plan your visit early in the day to see all enjoy the fun and exciting presentations.the zoo offers, make sure to experience the numerous exhibits! The zoo has about 70 species, though all may not be on display at any given time. The primary path through the zoo is approximately one-mile long, and winds past the main animal exhibits and through a tropical garden, which were 1st planted in 1919. Primates in the zoo are housed on islands surrounded by a man-made lake, and can be viewed from catamarans when visitors take the Primate Expedition Cruise. Don't miss the opportunity to visit this popular attraction when visiting Naples Florida. The zoo is accredited by the Association of Zoos and Aquariums, and is an institutional member of the American Association of Zoo Keepers. Naples Florida Attractions, Vacation Rentals, Restaurants, etc.